Daryl was a pleasure to do business with! Pleasant, professional, and prompt. I had a door crease right along the edge and Daryl immediately pointed out that because of the location, the seam may not be 100% correctable. That being said, he assured me he could get it close to that and boy did he! He even did a little paint touch-up where the door was originally damaged. All done in a timely, efficient manner. You want honest, quality dent repair done, Daryl is your man! Darryl did a great job on the Prius I asked him to bang out a dent on my 2001 4runner. Once again another job well done! Thanks again! What can I say. Darryl is the man! I got this terrible dent on the body line of my car. I got quotes from 5 different guys. Some said they couldn’t do it or some quoted me as high as $650 and had to remove the window. Some said they had to repaint my car. Some didn’t even call me back! I felt that it was an industry where it’s hard to trust a guy to be qualified and knowledgeable enough to touch my car. I was lucky to find dent craft on yelp. He quoted me $325 half of what others quoted. He has +20 years experience. Great customer service and all around nice guy. Rest assure you can trust him. He’ll give you a reasonable price and quality workmanship. He is now my go to guy. Please don’t get ripped off by other dent repair guys. Go to Darryl. He was honest and said he can get it to about 90% but I was impressed! It’s 100%. I recommend this guy. I will attach some photos. This is the 2nd 2013 vehicle Darryl worked on for me. Both times 5/5 stars. Professional mobile PDR service at a very reasonable rate. Granted, the quarter panel was not restored to factory curves, but Darryl gave a good effort (2 hrs) and I am pleased with his skills. I blame my trade and OCD for grading the result at 80% restoration – primarily as the curves do not align with the bumper’s. For most, this is exceptional work and I doubt shops can do better without resorting to bondo. Looks like he may have slipped and chipped off a minuscule spot of paint on the tip of the body above the tail light. Not a big deal, can be retouched. To read even more, see our 5 star reviews on Yelp. Click here. DentCraft was recommended to me from a local body shop for possibly fixing a softball sized dent to the drivers side rear door of my 2006 Acura TL using the Paintless Dent Removal (PDR) technology. I am extremely happy that I went the PDR route. I called Darryl that day and he asked me to send him some pics of the damage. He quoted me and said that a 90% perfection could be attained due to the location of the dent. After the work was complete, I can’t be any more satisfied with the repair. It’s probably closer to 100% perfection now. Darryl was prompt, professional, honest and thorough, everything you’d want in someone providing service on your vehicle. I highly recommend PDR with DentCraft if it’s possible. This time my 2004 Honda Element was towed to the dealer recently to have a clutch installed. So, because my car would not go into any gears, the guys decided to push it in the bay causing two dents along the tailgate. The dents were on a body line which made me think that there was no way for this to be repaired. I called Darryl. He made an appointment with me. I tell ya, he spent about 45 min and completely removed both dents. I was amazed. Darryl gets the job done right! He is professional and cares about his customers. There are not to many people out there like him,Period. Highly recommended! I got a dent on my car, and went to a local body shop in Fremont for an estimate. After looking at relatively small dent, they kindly recommended me to contact with DentCraft because the paint on the body did not show crack on it. The estimate that Darryl gave to me was much cheaper, so I asked him to fix another dent on my wife’s car as well. He came to my house and fixed both perfectly in a matter of 1 hour, and then gave us a discount! In another occasion, I had an even bigger dent, but again, Darryl came to fix it as though nothing had happened. 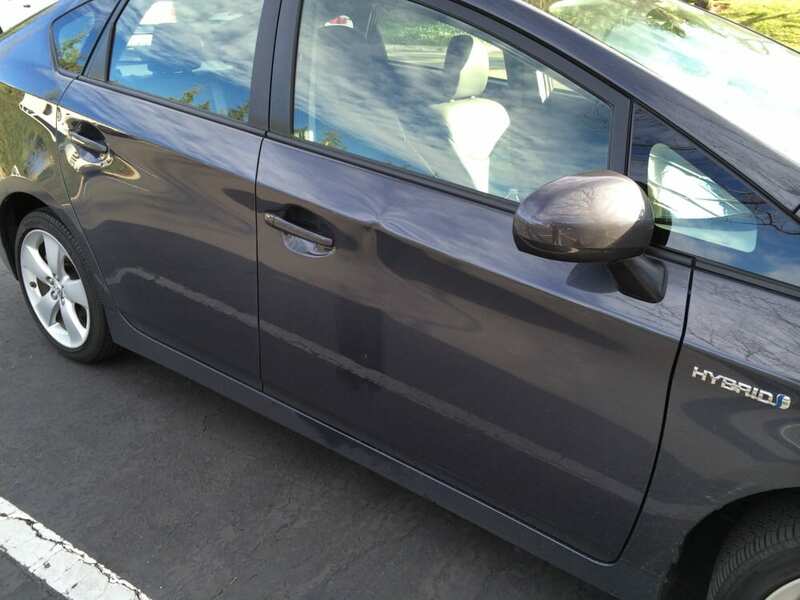 We were very happy about much lower price compared to body shop, nice finish, and quick work. Thanks, Darryl! Darryl just finished a small ding on my boyfriend’s car. He gave him a free quote after sending him pictures, and made an appointment to fix it the next day. He showed up when expected, and did a perfect job. It’s like the ding was never there. Would definitely recommend! Darryl was very honest with his assessment of my car dent. He told me upfront that it was unlikely to be perfect given the tough angle my car was bumped. His estimation was 80% to 90% restoration. He also offered to also help me polish off a few of the scratches. Just 30 minutes into the repair, I took a peek and the dent was hardly noticeable and at the very end the car looked nearly unblemished! Amazing! Thanks for being honest from the beginning and giving me a discounted price compared to the quotes I’ve been given elsewhere! I emailed Daryl the night before I asked for an appointment. Not only was he the first to answer back AND BEST PRICING, but made an availability for my repair the next day. Daryl called and explained his estimate and scheduled the repair in the same day. He came to my job location and did an excellent job!!! He has saved me HUNDREDS!!!!!!! He has saved me HUNDREDS!!!! 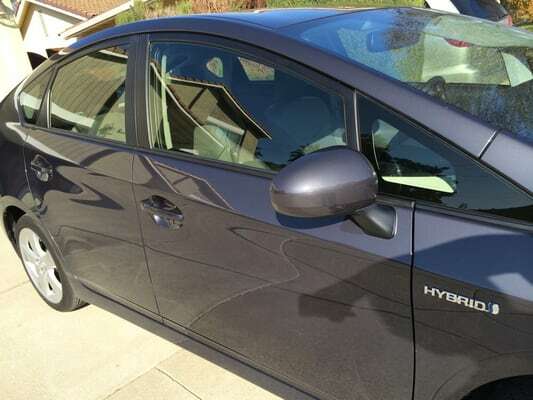 Great job on the Prius! DentCraft - Paintless Dent Removal, serving the following cities - Fremont, Newark, Union City, Hayward, San Leandro, Oakland, San Jose, Santa Clara, Sunnyvale, Milpitas, Los Gatos, Saratoga, Mountain View, Palo Alto, Los Altos, Menlo Park, Redwood City, San Carlos, Dublin, Danville, San Ramon, Pleasanton, Livermore. Copyright © 2018 | DentCraft PDR. All Rights Reserved.